- Bow rider. Boat interior/exterior, are in excellent condition. Includes custom snap on boat covers (great condition), plus overall boat cover (used once), Larson chrome wake board tower with board rack and bimini top, two anchors (river/lake), 2-man tube, 1-man tube, adult wake board, youth wake board, tow ropes, ski rope, bumpers, 10 life jackets (all sizes), oars (just in case), hook (retrieve overboard items). - Volvo Penta 5.7, 230 hp, extremely clean, well maintained motor. - Larson EZ Loader trailer, tandem, custom wheels, surge brakes, tires are nearly new. 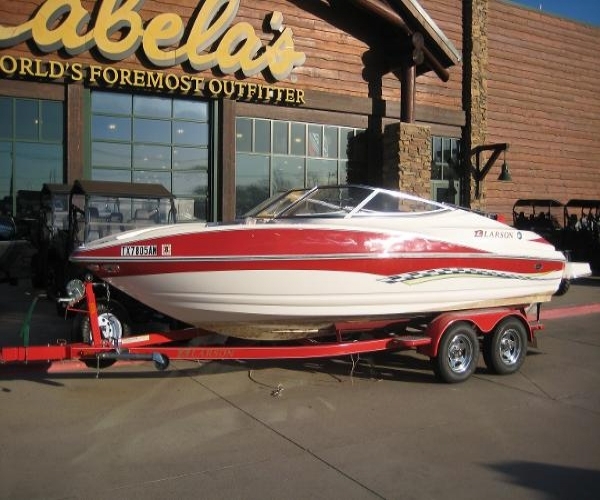 - Picture shown is the same make and model of boat and trailer, however it doesn't have the tower and other accessories.